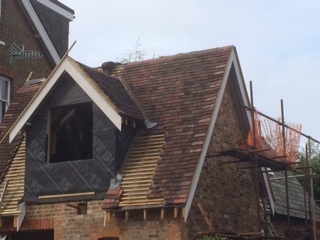 Whilst carrying out a HomeBuyer Survey for a Client in Reigate we noticed this refurbishment and re-roofing project on an old coach-house conversion. Handmade clay tiles were being used as this is a Conservation Area and the materials used as roof coverings are a very sensitive matter to the local Conservation Officer. The additional cost over and above the cost of using machine concrete tiles is worthwhile as it will enhance the market value and saleability.